These Overland Park homeowners had a beautiful backyard shaded with lots of trees. They had an existing deck that unfortunately would get covered with dirt and other items that fell from the trees. They were looking for an enclosed dining area that was protected from everything falling from the trees. They wanted to make sure they continued to have natural light on their new porch. 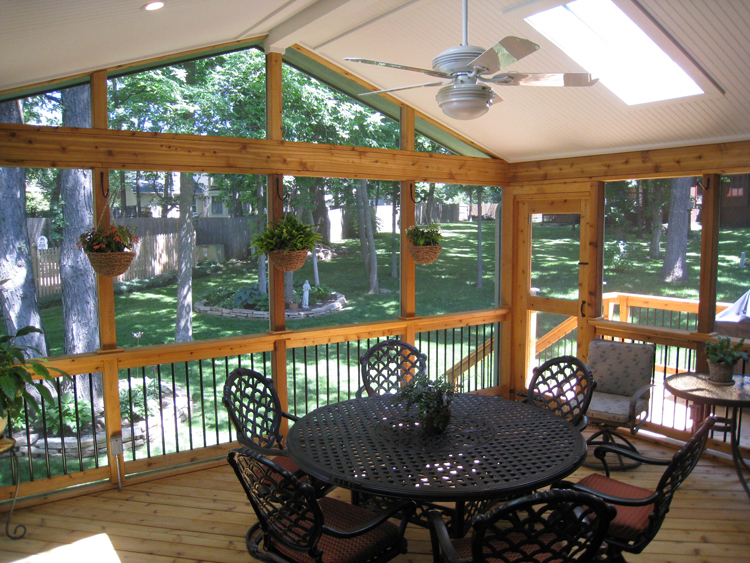 When considering building a screened porch or other room, It’s important to know whether you plan on using your porch for dining or seating or both. This family wanted a room for dining with their grill right nearby. They had an existing deck that was not stable so we tore it down. In addition to the porch, we added a small deck for grilling and that allows room for a small table and chairs. For the interior of the screened porch, we used cedar for the flooring, the wall posts, and the railing. The owner liked the authentic look of real cedar wood so he wanted to use a bit of it. For the ceiling we used white beadboard with built-in lighting and 2 Velux skylights for that extra natural light. We used the same railings on the deck portion and inside the screened porch which was Deckorator aluminum balusters. It’s important that the porch looks original to the home so the exterior of the porch was painted to match the exterior color of the house. You can see from the interior view that the family can still enjoy the view of their wooded backyard while keeping their eating area protected from leaves and other things that fall from the trees. They can also enjoy bug protection with the screened room. 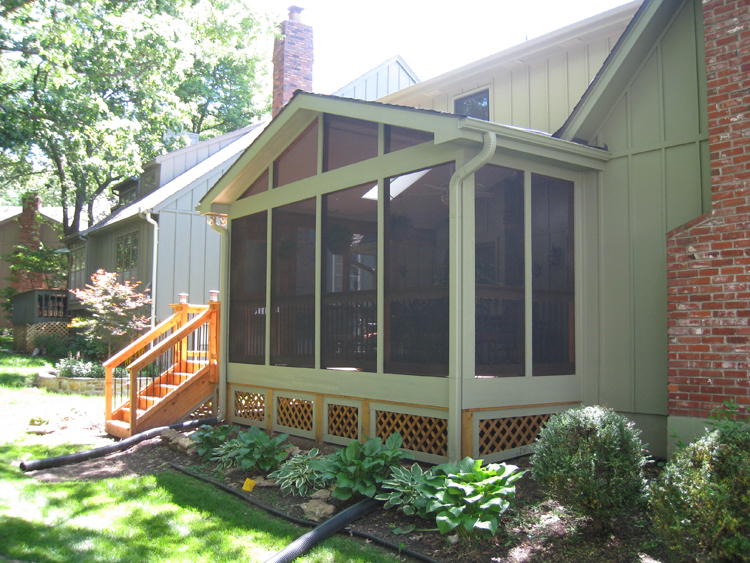 If you are considering adding a porch, deck, or other outdoor living area to your home, give us a ring at (913) 851 – 3325 or drop us an email at kansascity@archadeck.net. We look forward to hearing from you. This entry was posted in porches, Screen Porches, Screened porch and tagged Archadeck of Kansas City, Overland Park porch, Overland Park porch builder, Overland Park screen porch, Overland Park screened porch, Overland Park screened porch contractor on May 29, 2012 by archadeckkansascity.